Can't decide or want to try a few varieties without buying a full bar? Or maybe you just fear commitment? We can get down with that. 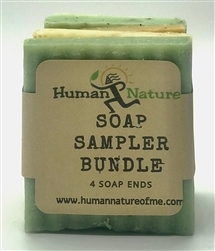 Check out our bundle of sample soaps: 8 oz of soaps, at least 4 varieties. Comes with a card that lists the soaps included. Random assortment, add requests to Order Comments box at checkout. Enter certificate amount after clicking "Add to cart."